Welcome to our blog, the place we share news and updates, and ruminate on all things parks and public lands. Check out our latest post and feel free to scroll through our archives; you’ll find interviews, articles on legislation, great web links, observations on national parks, and much more. The recent government shutdown continues to have far-reaching impacts on our national parks and national park service employees. And it continues to impact the operation of the federal government. Though it’s nearly March, the FY 2019 appropriations bill just went into effect, and the administration is delayed in releasing their budget for FY 2020. Before we get into the weeds on next year’s budget, let’s talk about some good news for this year. Congress rejected the large budget cuts presented by the Trump administration for FY 2019. Instead, they’ve created a bipartisan act which provides $3.22 billion for the national park service, which is $20 million above the amount from FY 2018, and $521 million above the president’s request. There is additional funding for more park rangers, which will help the NPS continue to protect and interpret our irreplaceable resources. Fixed costs are covered, which is certainly helpful more parks and offices. There is support for historic preservation programs and heritage areas that will help maintain both park resources and important structures found throughout the country. There is some funding for newly established parks to ensure that protection and visitor services will be established as soon as possible. And, the act continues to support the construction program and the Centennial Challenge funds, which will help address the deferred maintenance backlog. Unfortunately, this good news about FY2019 is outweighed by continuing concerns regarding FY 2020 funding. The bottom line is that even with the increased appropriations provided during the last two fiscal years, national parks struggle to fully satisfy their mission; to ensure that irreplaceable resources are protected and to provide the best possible visitor experience. The deferred maintenance backlog is certainly a looming concern. Half of the backlog is the result of thousands of miles of roads, bridges, and other supporting structures that are in dire need of repair. With more and more people enjoying all our national parks have to offer, this only puts additional stress on the aging structures found in the parks. 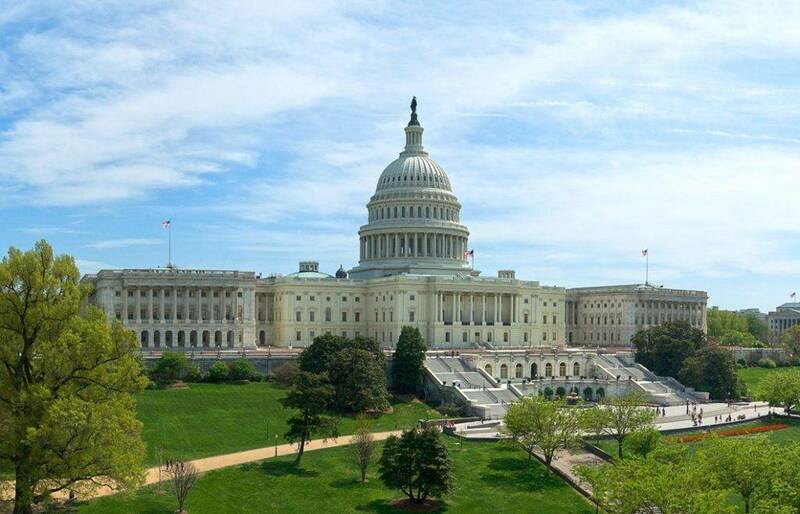 While the modest increase in appropriations for construction in FY 2019 will put a dent in the $11.6 billion backlog, funding remains inadequate to truly reduce it in a substantial way. So where does that leave us? The backlog of maintenance and restoration needs continues to grow. And it does no good to repair park buildings and other assets if there is inadequate annual funding to maintain them. The Coalition believes the National Park Service needs a dedicated source of revenue to address the maintenance backlog, such as that being proposed in the Restore Our Parks Act. There will be no reduction in the backlog if funding is unreliable from year to year. And this revenue must be in addition to current annual appropriations, not in place of annual funding. However, the deferred maintenance backlog is only a piece of the budget puzzle. The NPS just does not have the funding to adequately staff and protect our parks. The agency is already suffering from significant reductions in staffing over the past decade due to decreased annual appropriations. To put this in perspective, appropriations for the National Park Service were $3.275 billion in FY 2009, a full ten years ago. This is $53 million more than was just appropriated for NPS in FY 2019. With inflation increasing by 17.3% since 2009, the NPS would need $3.84 billion in appropriations this year just to stay even with inflation. The Coalition believes Congress must increase NPS appropriations by $565 million in FY 2020 to bring the NPS back to the level of services the agency provided back in FY 2009. The addition of new parks and programs, which are often celebrated (and justifiably so) also puts stress on the NPS budget. Over the last 10 years, the NPS has been directed to manage 27 new parks, 5 more national trails, 5 new wild and scenic rivers, and to coordinate assistance for 3 new affiliated areas and 9 national heritage areas, along with 8 grant programs. On top of this, park visitation remains high. Effectively managing these demands is proving more and more challenging with funding that has not kept up with costs. This means NPS annual appropriations are spread thin, as Congress adds new responsibilities without enough funding. Here’s the tricky part. While the addition of new parks adds stress to an already inadequate budget, there is also a large land acquisition backlog. At the end of 2016, an estimated $2.1 billion was identified as necessary to purchase privately owned lands within current park boundaries. And in case that wasn’t concerning enough, the current administration has adopted a freeze-the-footprint goal, which blocks acquisition of key parcels of land and leaves them vulnerable to the threat of development. There are also numerous historic structures across the country are in danger of being lost because of inadequate appropriations from the Historic Preservation Fund. As required by law, $150 million a year goes into this fund; but appropriations have not kept pace with the need. 331 million people visited national parks in 2016, bringing an estimated $18.2 billion economic impact to local gateway regions. Our national parks are clearly special places in the mind of the American public and we must make sure that Congress truly understands this. Our goal is to encourage a deeper understanding about what is needed to protect the important natural, historic, and cultural resources under the care of the Park Service, as well as what is needed to provide for a quality visitor experience. The NPS needs more funding and it needs reliable funding. The maintenance backlog, staffing, new parks, new lands, and preservation are all pieces of the puzzle. We must take all of these factors into account. We must continue to advocate loudly our national parks. Coalition Executive Council Member Richard Ring recently testified before Congress regarding the FY 2020 budget. His testimony provided the content for this post. Click here to read the full script of the testimony. The damage assessment from the recent government shutdown is just beginning. We’ve read about people who treated our irreplaceable resources terribly, damaging delicate vegetation, dumping waste, and leaving graffiti. The Coalition has released a summary of impact surveys, undertaken by our members, detailing some of the shutdown impacts at national parks from Cape Cod National Seashore to Hawai’i Volcanoes National Park. While this damage to our natural and cultural resources is devastating and disturbing, there are unseen impacts caused by the recent shutdown that will also leave an unfortunate and lasting legacy. Like all our Coalition members, my life is strongly tied to the National Park System. I am the Communications and Advocacy Coordinator for the Coalition and my husband is a current NPS employee. We spent a lot of time these past few weeks worrying about our finances, unsure of how long it would be until we received our next paycheck. We have a mortgage, student loans, car payments, and all the expected utility bills. We have young children, which means we also have a plethora of childcare expenses, doctor visits, and frequent trips to the grocery store. We were lucky. We had access to lines of credit and a supportive and generous family who could help us out if things got tight. 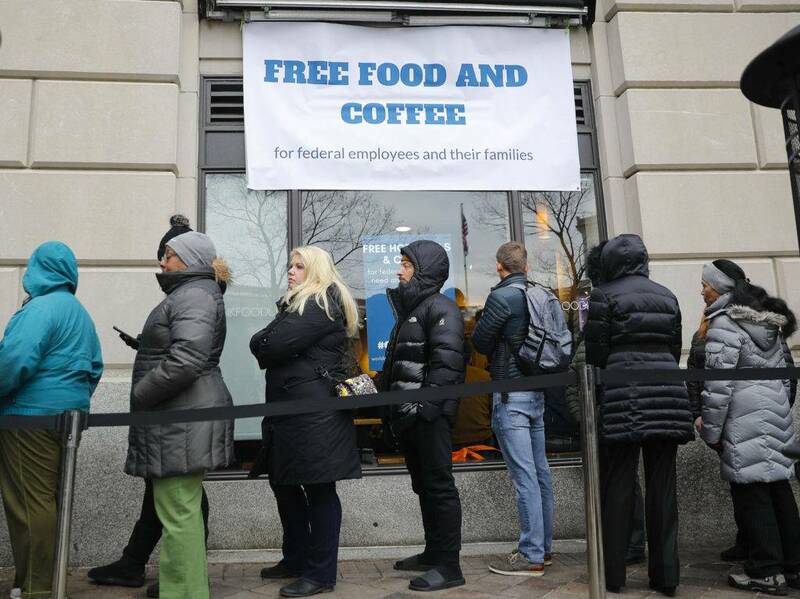 But for many Americans, the shutdown did not just cause “a little bit of pain” or represent a small inconvenience. It was trying to figure out how to stay afloat with no income. How to pay your childcare provider to watch your kids while you worked without pay as an essential employee. Could you defer that loan payment? Skip the credit card? It was a scramble. We were just waiting for our government, who is entrusted with “the care of human life and happiness,” to get it together. Now the shutdown has ended, and the federal government must regain trust; frankly, they’re off to a rocky start. We are still living in the midst of uncertainty, wondering if the government will shut down again in a week. There is an emotional toll caused by the political gamesmanship. And there is a toll taken on the future of our federal workforce. We will lose current federal employees who can’t continue to ride out the lack of paychecks. We will lose new, young talent who are eager, motivated, and looking for their first job. Would you seek out employment with a government that can’t guarantee you a regular paycheck? Or would you turn to the private sector, which suddenly seems more stable? As advocates for our national parks, we need to make sure our voices are loud in support of the parks and the people who care for them. The fight to protect our national park system and public lands is far from over. As the damage assessments continue, we also need to keep an eye on the unseen impacts, the long-term consequences of uncertainty, anxiety, and financial hardship. This shutdown was incredibly harmful, and we should expect better. Where is Jefferson’s good government, the one of the people and by the people? Our elected officials are part of a government that exists for the people. They need to start acting like it. 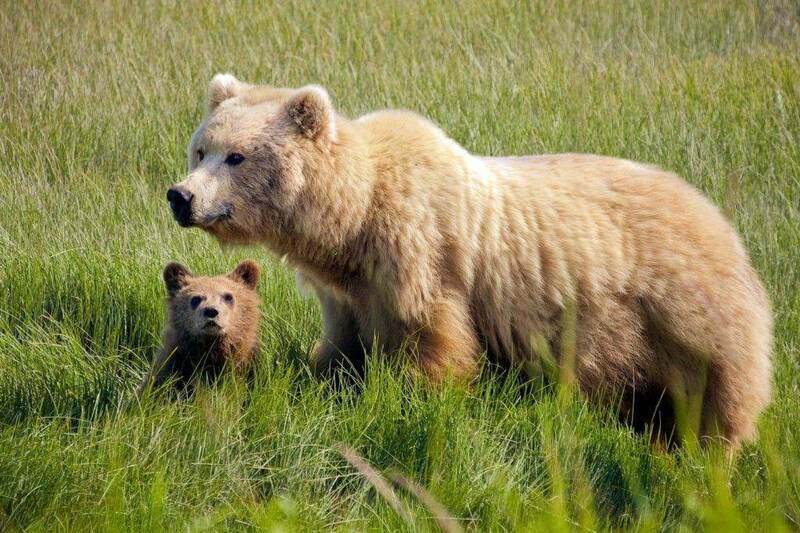 Large carnivores, including brown bear, black bear, and wolves, are under attack in Alaska. They are in danger even on some National Park Preserves and National Wildlife Refuges. Alaska’s approach to wildlife management is a throw-back to an older time, when these predators were targeted for reductions in hopes that hunters would benefit from having more moose, caribou, and deer available as prey. And this approach is being implemented without effective monitoring programs. To our knowledge, Alaska is unique in the world because this management priority is both widespread and mandated by state law. Predators are controlled in some other areas of the world to reduce losses of domestic livestock. In parts of Canada, for example, there are concerns that reductions in wolf abundance may be necessary to bolster woodland caribou populations depleted by habitat losses. But in most of the world, there has been a paradigm shift away from predator control in order to supposedly benefit their prey. The National Park Service published a regulation, effective in 2016, to prevent some of these practices. This regulation is still in effect today. However, the current administration is actively working to eliminate this Alaska NPS rule and we should expect to hear more about this regulatory activity early this spring. If the administration succeeds, bears and wolves living on National Park Service Preserves will be directly affected by the State’s Intensive Management statute and put at risk. The Coalition to Protect America’s National Parks has been working in partnership with other environmental and conservation groups to protect Alaska’s carnivores. You can read about their actions here and here. My colleagues and I have recently published a paper in PLOS-Biology which explains how the State of Alaska’s 1994 Intensive Management statute is affecting these large carnivores throughout the state. It can be found here. I was also involved in writing a in-depth article focusing on the legal framework for NPS’s management of wildlife in Alaska’s National Parks, Preserves and Monuments in the time when Frank Murkowski and then Sarah Palin were governor of Alaska (insert link ) for Alaska Law Review, arguing that as the implementation of that management statute becomes increasingly widespread, it is ever more important for the NPS to recognize that Alaska’s current Intensive Management Program is preempted on NPS lands based on a theory of direct conflict. Enlightened scientific management is needed to put Alaska back on the path to avoiding the errors in predator management of a century ago. Sanford (Sandy) Rabinowitch is a retired NPS employee who worked for the NPS in Alaska for 31 years and still resides in Anchorage, Alaska. 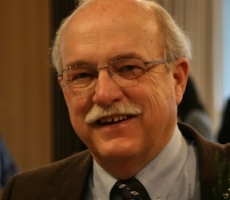 He served as a Subsistence Manager, the Chief of Coastal Programs Division, the Exxon-Valdez Oil Spill Restoration Specialist, and an Outdoor Recreation Planner. Prior to his work with the NPS, Sandy worked with the Alaska State Park System as the Chief of Operations, a Supervising Landscape Architect, and a Park Planner. Sandy is a Senior Consultant for DOI’s International Technical Assistance Program (ITAP), DOI Office of International Affairs and has worked in several countries on behalf of the federal government. He holds a B.S. in Environmental Planning and Management and a master’s degree in landscape architecture. The recent death of former President George H.W. Bush was a temporarily unifying moment for our divided country. His funeral brought together members of both political parties to pay tribute to a statesman and a leader. Politicians and the public may have disagreed with former President Bush’s policies and actions, but most people spent at least a few moments mourning his loss. These current events have led us to recall other past presidents, both living and deceased. The National Park System is home to monuments, memorials, houses, tombs, and landscapes dedicated to our nation’s former presidents. These sites preserve the stories of their childhood experiences and capture the importance of adult accomplishments. According to the NPS, the “preservation of presidential sites extends beyond park boundaries. Many of the National Park Service’s cultural resource programs also have ties with the presidency, including the National Register of Historic Places, the National Historic Landmarks Program, and Teaching with Historic Places lesson plans.” The George W. Bush Childhood Home in Midland, Texas, is a good example of this. It is operated by a non-profit organization but also listed on the National Register of Historic Places. 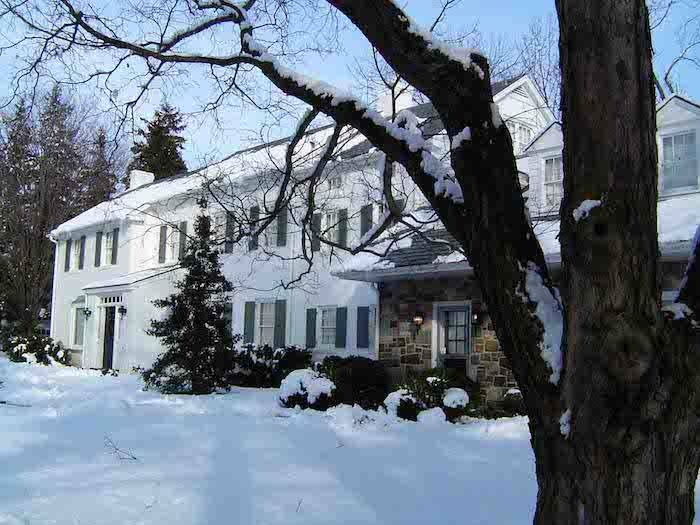 This small, one-story house was home to the Bush family from 1951-1955. The house museum has been restored to the appearance of this time period and there are future plans to acquire neighborhood homes that would provide space for a Visitors Center and an exhibit gallery. Other sites, such as Monticello, allow you to walk the same floors as one of our Founding Fathers. While Monticello is owned and operated by the Thomas Jefferson Foundation, it is also a National Historic Landmark and a UNESCO World Heritage Site. Alternately, other sites such as the President Bill Clinton 1st Home Museum in Arkansas and the Eisenhower National Historic Site in Pennsylvania, are units of the National Park Service. One of the most unique presidential sites is in the small town of Plains, Georgia, where you can stop by President Jimmy Carter’s Boyhood Farm or the Plains High School Museum (all part of the National Historic Site). There is also a large preservation district in Plains, made up of sites associated with Jimmy and Rosalyn Carter. And if you visit Plains, you may even catch a glimpse of President Carter himself. He still lives in the small town and teaches Sunday school at Maranatha Baptist Church when he’s in residence. The American Presidents Shared Heritage Travel Itinerary is a list of 43 sites associated with the NPS that aids visitors in exploring the lives and contributions of our past American Presidents and is available online (PLEASE INSERT LINK – https://www.nps.gov/nr/travel/presidents/list_of_sites.html). Millions of visitors travel to these sites every year. And ostensibly, some of these visitors also disagree with the policies and actions of these men during their tenure in office. So why visit? Is there is something inherently special about the office of the President that draws both supporters and detractors? Is it a desire to be close to power or to better understand success? Or is it simply that, despite the apparently increasing political polarization that is trumpeted from coast to coast, we can still appreciate that people are nuanced and complicated. Here, I think lies the answer. Perhaps the popularity of presidential sites and the steady stream of visitors from all walks of life is a good reminder that we can disagree with policies and politics but still respect the person. That we might not applaud a former president’s political decisions, but we still want to learn more about his family life at a childhood home or pay our respects at his tomb. Our National Park System is so diverse and it’s important to remember that our parks protect irreplaceable cultural resources in addition to our natural treasures. Our past informs our present and these parks preserve our history. NPS interpreters at these sites are experts in not only bringing the past alive but building bridges and making connections. In todays world, this is a terribly important mission to continue to uphold. Just a quick note that our annual Giving Campaign has officially begun. Our current members have already received an email and you’ll receive more reminders in the coming weeks. We know that many of you are engaged in a host of issues, particularly as more and more troubling legislation and policies are proposed. We know you may be spread thin, both emotionally and financially, and we truly appreciate your continued support and dedication to protecting our parks. The Coalition to Protect America’s National Parks is a unique organization. While there are other preservation and conservation groups working on behalf of our public lands, the Coalition is the only organization made up exclusively of current and former National Park Service employees, representing all levels and job disciplines of the agency. Our group’s voice, the voice of experience, is incredibly important and we need your help to continue to educate, advise, and advocate. Our efforts have made a difference but there is still a great deal of work to be done. Please keep an eye out for future communication and consider making a gift to the Coalition. Your contribution will make a difference! And we promise to keep working hard on your behalf to protect our parks. Phil Francis served as a National Park Service employee for over forty years. His numerous assignments in national parks across the country have given Mr. Francis the wisdom and experience of a career employee. His status as an NPS retiree gives him the freedom to speak openly and honestly about NPS-related matters. Though he retired in 2013, Phil remains heavily engaged in the current issues and policies impacting our national parks, especially in his capacity as Board Chair for the Coalition to Protect America’s National Parks. We asked Mr. Francis a few questions about his time with the NPS, the challenges facing our parks and public lands today, and his vision for the Coalition’s future. You’ve been with the NPS since 1972. How did you start your career in the Park Service? Phil Francis: I began my career as a seasonal GS-4 Park Ranger at Kings Mountain National Military Park and continued as a seasonal employee until I graduated from Clemson. Working in a small park required me to do a range of duties such as working the visitor center desk, presenting hundreds of interpretive programs to the public, and performing basic law enforcement duties and maintenance tasks. I remember one of my assigned duties was to down diseased hazardous pine trees with axes. My blood turned green quickly as I thoroughly enjoyed the public interaction and became committed to the NPS mission. You spent forty-one years as an NPS employee in numerous parks and capacities. Could you tell us a little about where you’ve worked and what positions you held in your years with the NPS? Phil Francis: After graduating from college in 1974, I was very fortunate to obtain a permanent position as a GS-5 Administrative Services Assistant at Kings Mountain. My duties included the full array of administrative responsibilities and I was able to attend management team meetings along with the division chiefs. In the summers, I volunteered to also serve as the camp director of a Youth Conservation Corps (YCC) program in addition to performing my administrative duties. It was my first experience as a supervisor and I loved working with young people to accomplish maintenance work, as well as teaching environmental education programs. In 1977, I applied for an internship and was lucky to be selected as an intake trainee in the National Capital Region (NCR). In addition to working in various administrative offices in the NCR Regional Office, I was assigned to work at several parks, including Prince William Forest Park, Harpers Ferry Center, Harpers Ferry NHP, and National Capital Parks-East. I attended the Introduction to NPS Operations at the Albright Training Center. I also volunteered to teach NPS classes, which I enjoyed and did for several years thereafter. All of these diverse experiences were of great benefit as they broadened my skill set and allowed me to form new relationships that would help me later in my career. After completing my internship, I was selected as the Administrative Officer of Chickamauga and Chattanooga National Military Park, where I served from 1979-1984. I also served as the camp director of a YCC program again. My time at Chick-Chatt exposed me to external partnerships for the first time and I saw the power and potential risks associated with these relationships. In 1984, I was selected as the Administrative Officer at Shenandoah National Park, and 1989 I became the Administrative Officer at Yosemite National Park. My time spent working in Shenandoah and Yosemite was a period of tremendous professional growth. Those parks placed such great emphasis on protecting natural and cultural resources, and Yosemite was by far the largest and most complex park I had worked in up to that point. In 1991, I was selected as the Associate Regional Director of the Southwest Region where I served for two years. Santa Fe was a great place to live and I was able to work with wonderful people in the regional office and the 38 parks that it served. In 1994, due to a major NPS reorganization, the Santa Fe Regional Office was one of three to be abolished. Fortunately, I was offered the position of Deputy Superintendent of Great Smoky Mountains National Park, where I served for 11 years until I was selected Superintendent of the Blue Ridge Parkway in 2005. In the Smokies, I was very involved in external issues, as we managed four environmental impact statements concurrently and we had strong relationships with local communities. We amended the General Management Plan (GMP) at Great Smoky Mountains NP and completed the first GMP for the Blue Ridge Parkway during its 75th anniversary year. During my career, I was fortunate to work with many excellent employees and was very lucky to have had so many great assignments. What drew you to the Coalition to Protect America’s National Parks? Phil Francis: As I assumed greater responsibility throughout my career, I was exposed to numerous external issues that affected our parks. As managers, I noticed we were often required to follow talking points developed by political employees who seemed to be less committed to the NPS mission than we felt appropriate. Many of my peers agreed, and we became more and more frustrated with the political realities of the time. As a retiree, I knew that I wanted to protect the NPS and its parks and programs. For the first time in years, I could speak out in a completely open and honest fashion. CPANP is known as the Voice of Experience regarding parks. Do you feel that your career in different parks and positions has given you a broad understanding of the issues facing the NPS today? Phil Francis: Definitely. In addition to my assigned career duties, I volunteered to take on additional responsibilities which helped me to gain important experiences and develop friendships. All of this work helped me to better understand NPS issues and the various ways to address them. What are the biggest challenges facing our parks and public lands right now? Phil Francis: The budget is a mess. With increasing interest on the rapidly increasing national debt, “discretionary” budgets are being squeezed to the point that the NPS may never receive adequate funding. This financial challenge, combined with increasing use of the parks and recent policy changes, greatly challenge the ability of the NPS to meet its fundamental mission of resource protection and visitor enjoyment. What sets CPANP apart from other organizations working to protect our parks and public lands? Phil Francis: I think that the fact that CPNAP has so many retirees as members, and the willingness of these members to get involved, has made the Coalition extremely credible and effective. How can members become more involved? What does CPANP need to continue to succeed? Phil Francis: We need to develop our capacity to effectively address timely issues, improve our communication, and expand our partnerships. CPANP members can contribute in a variety of ways – by sharing their thoughts with members of Congress and the current administration, helping the Coalition financially, signing on to Coalition letters, encouraging other eligible people to join, and by volunteering to help spread the word on specific issues through letters to the editor, interviews with the media, and visits to representatives on Capitol Hill. What are your goals for CPANP as the current Chair? Phil Francis: My goal is to expand the capacity of our organization to ensure our effectiveness in accomplishing our strategic plan, ensuring the continued to growth of our membership, and continuing to strengthen our communications with Congress, our partner organizations, the parks, and Americans across the country. Autumn is a magical time of year. The brilliant colors are awe-inspiring and there’s something about a chill in the air that feels invigorating. It’s a time to slow down and appreciate the ephemeral beauty of nature, to enjoy the great outdoors before the impending cold of winter. It should come as no surprise that exploring our national parks is an excellent way to get outside and truly enjoy an autumnal day. Mountains, plains, desserts, and forests all provide different but beautiful terrain to witness the changing seasons. And if you need another reason to Find Your Park this fall, think about the benefits to your health. We’ve recently marked World Mental Health Day, a date set aside to raise awareness of mental health issues around the world and mobilize efforts in support of mental health. And as it turns out, getting outside is good for both your physical and mental health. A study out of Stanford University found “quantifiable evidence that walking in nature could lead to a lower risk of depression.” Lead author Gregory Bratman believes that their findings could help demonstrate how nature has an impact on an “aspect of emotion regulation – something that may help explain how nature makes us feel better.” Another Stanford study, completed in 2015, found that those who walked in nature experienced a decrease in anxiety, benefited from improved cognition, and experienced more positive emotions. Spending some time outside can also contribute to your improved physical health, which will likely come as no surprise to outdoor enthusiasts. Hiking, kayaking, running, or just taking a stroll through a national park may reduce your stress levels and blood pressure. In a study conducted in 2016, people were asked to engage with nature every day, for a month. At the end of the study, those taking part were “found to have sustained increases in happiness, health, connection to nature, and pro-nature behaviors.” And since an improvement in health is related to an improvement in happiness, there seems to be good things happening when one connects with nature. Convinced that some leaf peeping might be good for your body and mind this season? Then we’ve got some great suggestions for you. The Wilderness Society has released a list of fifteen national parks that offer stunning views of fall foliage. National parks like Shenandoah, The Great Smoky Mountains, Cuyahoga Valley, and Grand Teton are all at peak in mid–to–late October, so the timing is just right. You can check out the full list here. We hope you manage to step away from the chaos of daily life this autumn and explore a national park. Soon enough, the season will change and many of us will seek out the comforts of home as we ride out the winter. If you do take some time to do a little leaf peeping, make sure to share your photos with us on social media. We’d love to join you on your adventures. As always, our national parks give us so much. Help us to continue to protect these amazing resources and consider sending a donation our way. We want to make sure future generations can enjoy these treasures and stay healthy, and happy, too. Our national parks are often referred to as America’s Best Idea and they have been set aside for the enjoyment of everyone. People of all ages and backgrounds, from all over the United States and across the world, visit our national parks. However, according to a recent article from National Geographic, roughly 78 percent of visitors to these parks are white. Minorities across the board are underrepresented as both visitors and staff in our national parks. The Latino population is the fastest growing demographic in the United States. They are also among the most underrepresented groups in conservation, outdoor recreation, and environmental education. The good news is that there are organizations trying to remedy this situation. Groups such as the Latino-led, Latino Outdoors, are working to create a national community of leaders in conservation and outdoor education. As part of this work, they intend to encourage the growth of the Latino experience in the great outdoors. National parks are a space where the Latino Community can share their voices and showcase how conservation roots have been ingrained in Latino culture for generations. The NPS has also recognized the need to increase diversity in national parks. In 2013, they created the Office of Relevancy, Diversity and Inclusion to address the lack of people of color in national parks. “For me, it’s more about the culture of the NPS,” says Sangita Chari, the head of the office. “We haven’t become relevant to them in their life.” And, while NPS employees are still about 83 percent white, the NPS says diversity is on the rise thanks in part to youth programs, like “¡Vamos Verde!,” an initiative aimed at Latino high school students. And that brings us to where we are now, celebrating Hispanic Heritage month. From September 15 – October 15, the NPS celebrates America’s rich Hispanic history and culture. And there are parks all over the United States that explore the profound impact Latino peoples have had on American history. The American Latino Heritage Discover Our Shared Heritage Travel Itinerary features a list of sites and recommended locations to visit. Coronado National Memorial in Arizona, for example, honors the Spanish expedition and the influence Coronado and his men had on the development of the distinctive Hispanic and American Indian culture still present today. 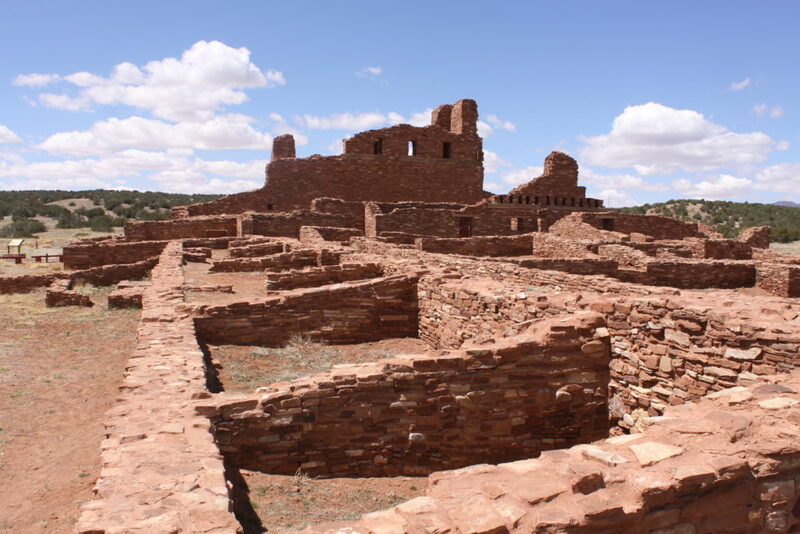 The Salinas Pueblo Missions National Monument in New Mexico preserves the history and heritage of the Pueblo societies and Spanish missions of Abó, Gran Quivira, and Quarai, which continue to stand as reminders of a time when the cultures of the American Indians and the Spanish converged. In addition to visiting specific locations, there are stories of individuals who have greatly impacted our shared history. Learn about leaders such as Cesar Chavez and Dolores Huerta, activists who dedicated their lives to improving the treatment, pay, and working conditions of farm workers. Study up on Doctora Concha Meléndez Ramírez, a literary critic and prolific writer who is considered the mother of Puerto Rican literature. There are toolkits and Teaching with Historic Places education plans to help teachers and parents bring these stories to life at home and in the classroom. The National Park Service has a long way to go to increase diversity in our national parks. But setting aside a time to encourage Americans to celebrate Hispanic history and culture is a step forward. There are resources available at https://home1.nps.gov/hispanicheritage/. And for more information about Latino Outdoors, visit http://latinooutdoors.org/. In honor of Hispanic Heritage Month, we encourage you to visit a new park, learn a new story, and celebrate the incredibly diverse nature of our country. Once our natural splendor is destroyed, it can never be recaptured. And once man can no longer walk with beauty or wonder at nature his spirit will wither and his sustenance be wasted. Where do you go to enjoy the great outdoors? Do you set out on a hike through the woods? Take a quick dip in a cool mountain lake? Where do you go to find peace? Do you feel it in the quiet inner sanctum of a giant sequoia grove? Do you hear it in the sound of the wind dancing through a meadow? Does it fall upon you slowly, as you watch birds soar high above in the remote backcountry? Time spent outside is inarguably good for our physical and mental health. It has positive effects on our blood pressure, stress levels, and outlook on life. It provides an opportunity for adventure, or an escape from the demands of work. Nature is something we can enjoy with friends and family to reconnect and grow closer through shared experiences. Or it is a place we might seek alone, to think and reflect and re-center. We take so much benefit and enjoyment from our country’s natural and cultural resources. 300 million people visited national parks, and half a billion spent time on public lands last year. And all this traffic can take a toll. Our resources are resilient, but only if we treat them right and give them the care they need. Why not take a moment to give something back? This Saturday provides the perfect opportunity to do so. September 22, 2018, is National Public Lands Day (NPLD). This is great excuse to enjoy the outdoors and hopefully offer a few hours of your time to help take care of our public lands. Public Lands are not just national parks. They also include monuments, wildlife refuges, forests, grasslands, marine sanctuaries, lakes, and reservoirs, as well as state, county, and city parks that are managed by public agencies, but that belong to, and are enjoyed by, all of us. National Public Lands Day is held on the fourth Saturday of September every year and is the nation’s largest, single-day volunteer event for public lands. 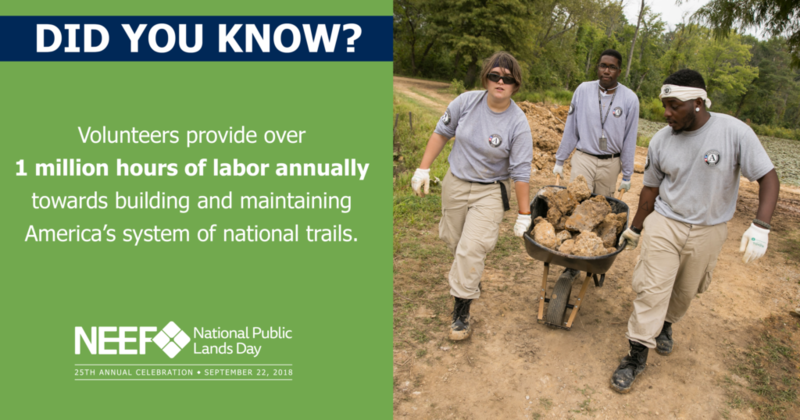 Each year, NPLD volunteers provide tens of millions of dollars’ worth of services in one day that would otherwise take limited park staff months to accomplish. Anyone can volunteer, as an individual or part of a larger organization. Bring your family, friends, neighbors, classmates, students, or coworkers to spend the day outdoors giving back to your community by pulling invasive species, maintaining trails, picking up trash, and more. 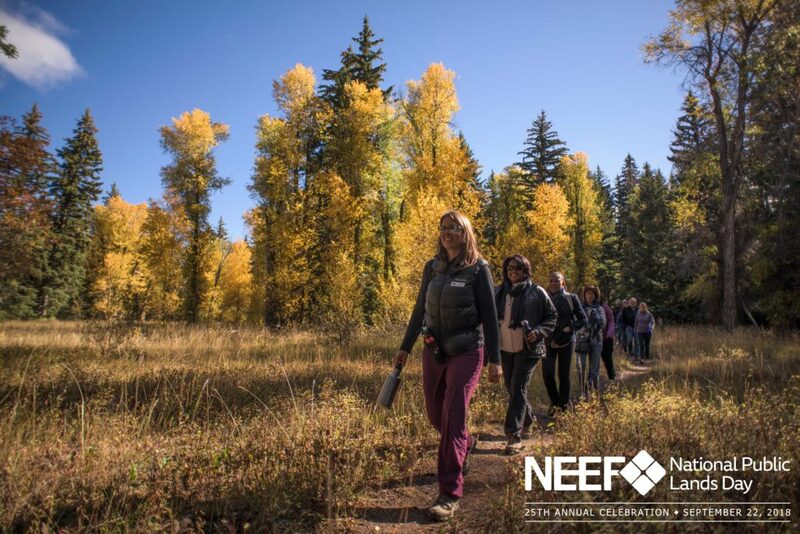 Many NPLD celebrations go beyond volunteer events to include recreational and educational activities, like hikes, bike rides, paddling, bird watching, and water quality testing. To encourage people to join the fun, NPLD is a fee-free day for national parks and most other federal public lands, state parks, and other local places. The Department of Interior also has a site devoted to National Public Lands Day. You can find their information at https://www.doi.gov/video/national-public-lands-day. Volunteer opportunities can also be found at volunteer.gov. We love our Public Lands. Let’s all help protect and preserve them! With the recent (and rare) good news on the progress of bills set to address the deferred maintenance and the continued funding of the Land and Water Conservation Fund (LWCF), we wanted to share some background and the recent updates regarding these two critical issues. The LWCF: What Is It and Why Do We Care? The LWCF was created by Congress in 1964 as a bipartisan commitment to safeguard natural areas, water resources and our cultural heritage, and to provide recreational opportunities to all Americans. This fund is the nation’s primary source for preserving nationally significant public lands, and for providing recreational opportunities in local communities throughout our nation. 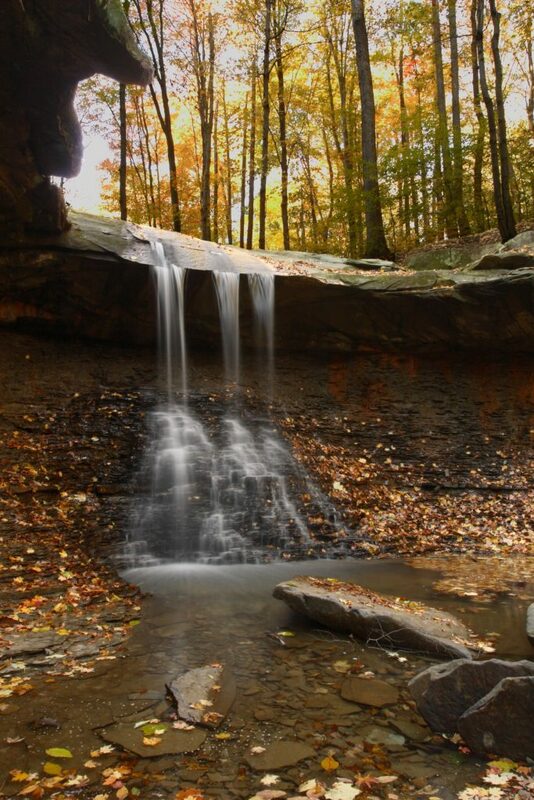 Every single state in America has benefited from the LWCF. “Federal Side” funding which is used to acquire lands, waters, and interests therein necessary to achieve the natural, cultural, wildlife, and recreation management objectives of federal land management agencies. National parks, as well as national wildlife refuges, national forests, rivers, and lakes have been set aside for conservation and public enjoyment thanks to funds from the LWCF. These funds also support the strategic acquisition of long-identified inholdings within national parks, allowing for the protection of significant natural, historic, and cultural resources while contributing to more cost-effective park management. “State Side funding” provides matching grants to States for planning, land acquisition, and the development of recreational opportunities. Local communities across the United States have benefited from these funds through the creation of children’s playgrounds, swimming pools, trails, and ball fields. The Fund relies mainly on revenue from the depletion of some natural resources – offshore oil and gas – to support the conservation of other precious resources – our land and water. Every year, $900 million is authorized to go into the fund, with most of that amount coming from OCS revenue. Although Congress only appropriated $431 million of that $900 million for federal land acquisition and the state grant program in FY 2018, every state and territory received a portion of funds from the LWCF. This is a critical investment not only in our quality of life, but in the American economy. Outdoor recreation, conservation, and historic preservation activities contribute more than a trillion dollars annually to the U.S. economy, supporting 9.4 million jobs. But Congress’ continuing authority to place funds into the LWCF will expire September 30, 2018. 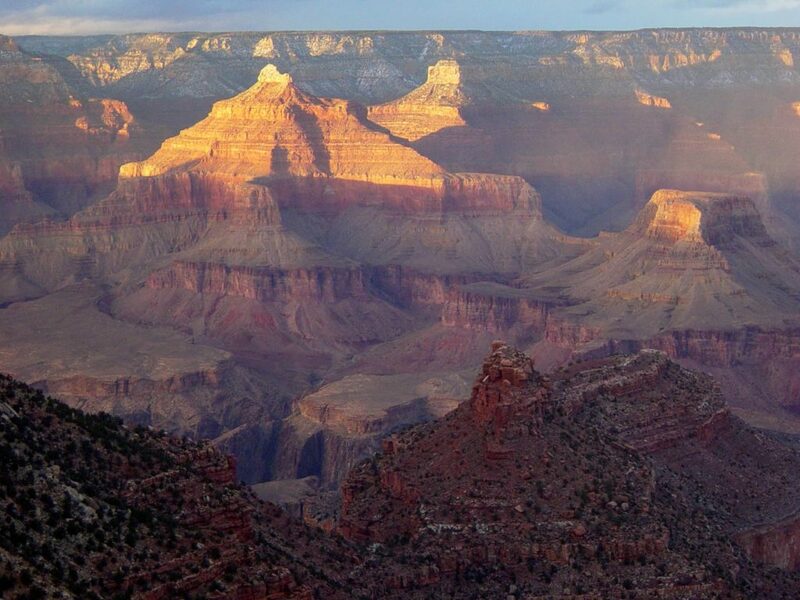 Without this money, state and national parks will lose millions of dollars in direct support. Residents from all 50 states and our territories will lose additional money and jobs from a reduction in tourism and related industries that depend on a vibrant state and national park system. The House Natural Resources Committee approved H.R. 502 last week, a critical and bipartisan agreement that would permanently reauthorize the LWCF. Natural Resources Chairman Rob Bishop (R-Utah) and Rep. Raúl Grijalva (D-Arizona), came to a surprise agreement, which was approved by a unanimous vote. This is a huge victory and would provide relief from the previous, eleventh-hour deals to temporarily authorize the LWCF. The proposed LWCF bill would allocate 40 percent of money to the fund’s state-side program, 40 percent to the federal land acquisition program, with the remaining 20 percent where it is most needed among the programs. Another provision would set-aside 3 percent for recreation access, requiring the Interior secretary to put together a list of priority projects. The Coalition strongly supports the actions of the House Natural Resources Committee. We hope that this is the first step in authorizing permanent dedicated funding through the LWCF so that the full $900 million going into the Fund is available each year for the purposes of meeting the land acquisition needs of our federal agencies. Deferred Maintenance – What’s The Latest? The other good news addresses the ongoing and substantial maintenance backlog at our parks and public lands. The House Natural Resources Committee also passed the bipartisan, Restore Our Parks and Public Lands Act (H.R. 6510) last week. This bill creates a five-year, $6.5 billion fund for Interior agencies to address maintenance and construction backlogs at parks, wildlife refuges, and Bureau of Indian Education schools. The money for the proposed “National Park Service and Public Lands Legacy Restoration Fund” would be made up of 50 percent of all otherwise unallocated revenue from energy production on federal lands and waters. The Bureau of Land Management, the National Park Service, the Fish and Wildlife Service, and the Bureau of Indian Education would all benefit from the fund. The Coalition also strongly supports the House Natural Resources Committee’s action to address the deferred maintenance backlog of the National Park Service. For the first time, the NPS will have a dedicated source of funding (up to $1.3 billion per year for the next five fiscal years) to allow it to move forward on hundreds of deferred maintenance projects throughout the service. These deferred maintenance projects will help ensure a better national park experience for thousands of visitors each year by repairing outdated educational and interpretive facilities, upgrading trails and campgrounds, repairing restrooms, and addressing park utility systems and maintenance buildings. H.R. 6510 will also provide significant resources for numerous deferred transportation projects within our national parks, which represent half of the current maintenance backlog. Funds provided in this bill will help repair roads, bridges, overpasses, and pull-offs used daily by park visitors. Despite the good news, both bills still have a long way to go. Both the permanent reauthorization of the LWCF and the Restore our Parks and Public Lands Act must pass the House of Representatives. The Senate has yet to take committee action on their versions of the bills. The Coalition will continue to advocate for both measures and urge our representatives to act swiftly to permanently reauthorize the LWCF and address the substantial problem of deferred maintenance. And with a September 30 deadline looming for the LWCF, we must continue to push for immediate action. We urge you to contact your senators and representatives and have put together some talking points if you’d like some guidance. https://protectnps.org/action-alert-lwcf-expiration/. Keep an eye on this site and our social media – we promise to keep you posted.